Every second house in the village of Uppada, in coastal Andhra Pradesh is a handloom store. Just like Mangalagiri. It goes with the territory. For it too is a handloom village that has brought forth a commercially successful style of saree. Known for its soft texture and lightness, what defines this saree is its thread count. A hundred threads go in lengthwise while a hundred and twenty go in sideways. Not a thread more, not a thread less. For it is this thread count that ensures the quality and feel of this beautifully rich handwoven fabric. 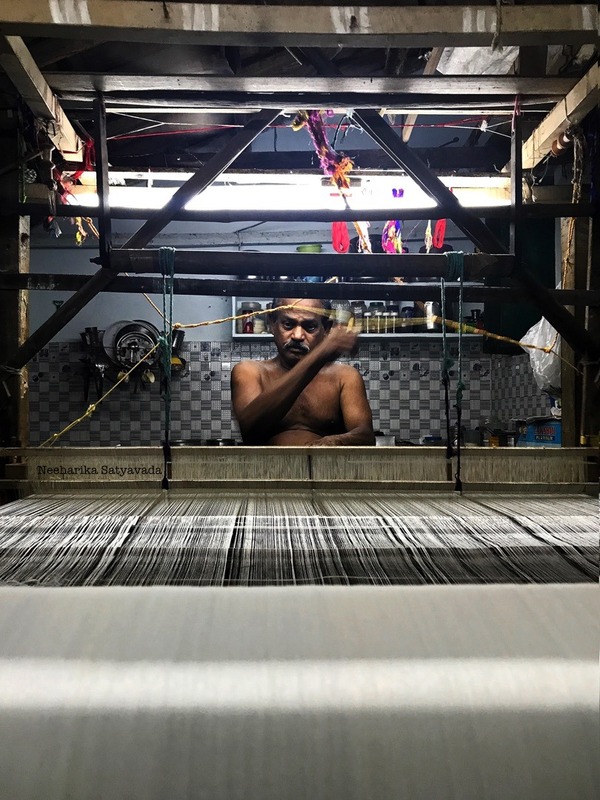 Once the royal garment of the rulers of Andhra Pradesh, weavers were prohibited from weaving these sarees for anyone outside of the royal household. Though it is now the favoured form of wedding saree, the Uppada weave has had quite a roller coaster ride. From being a simple cotton saree in the 1950s, to fading out in the 80s to achieving the Geographical Indication tag in the 2000s. Today this saree sells from anywhere upwards of Rs.6000/- to around Rs.3,00,000/-, not taking into account the custom orders of course. This style of weaving is a local variation on the three hundred year old Jamdani technique. The Uppada Saree evolved to its current form when Bangladeshi weavers came and settled in Uppada and the traditional Jamdani technique took on a new essence. So, don’t be surprised if you hear the Uppada Pattu (silk) Sarees being referred to as Uppada Jamdani Sarees. For its origins can be traced back to today’s Bangladesh. That late Ms.Jayalalitha, erstwhile Chief Minister of Tamil Nadu had once come to Uppada to commission a saree made with threads of pure molten gold! & that today there still is a picture of her in that saree at the weaver’s house. Getting There: 16 kilometres from Kakinada and almost 500 kilometres from Hyderabad, a trip to Uppada is better done on a road trip through Konaseema. Remember: Avoid the bigger stores with the glass fronts and the air-conditioning. It is in the smaller houses that you will find the better stuff. Not just in terms of the quality of the threads used but also in terms of design and colour. 😄 & So many stories to tell!! Good to know about the village, did not know about it, thanks for sharing with beautiful captures. Nice pictures! The sari looks so vibrant!